Summary: IP Tools for Excel adds sheet functions and fully automatic or programmable, macro like VBA script features to Microsoft Excel. These are tools and functions to support IP network systems test and evaluation. There is a GUI and Ribbon interface. Some features include ping, ping sweep, bulk ping, DNS lookup, nslookup, sort IP addresses, launch remote desktop protocol RDP, launch SSH, launch telnet, launch http and https, trim clean cells. Sheet functions to remove shading, remove comments, remove text color. 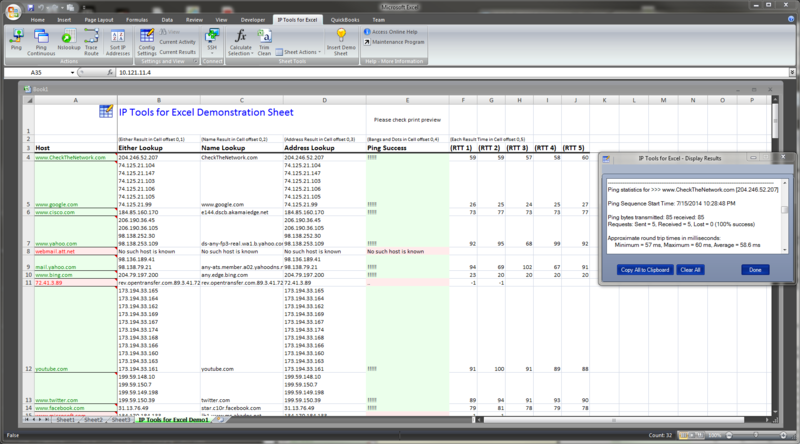 Excel worksheet functions to ping, nslookup, open TCP ports, open http web pages and get SSL certificates. IPv6 supported by nslookup. IPAM and subnet calculations. 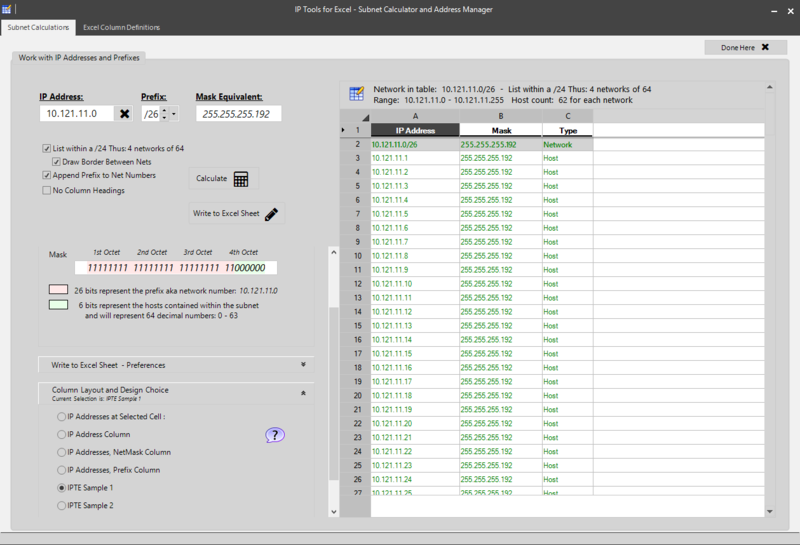 IP Subnet Calculator and Subnet Cheat Sheet: Now part of Excel. Easy to learn and practice ip subnetting then pass CCNA testing. This free tool only operates with IPv4 at this time. When you manage IP addresses in Excel you will find the functions for Nslookup and Ping useful. The Excel Column Definitions tab allows for inserting any Excel function or macro into the sheet. Short video demo below - You might never type Ping at the CMD prompt again! Advisory: IP Tools for Excel is capable of generating large amounts of network traffic. High packet per second rates can consume large amounts of network bandwidth. It can cause network security systems to alarm and block traffic. Traffic patterns generated may be considered Denial of Service Attacks (DOS). Please use this tool responsibly and professionally. Network performance monitoring is now available in Microsoft Excel. Test network latencey with Excel. Be proactive.